An American monetary dove in London, Posen helps set British interest rates. (MONEY Magazine) -- These are migraine-inducing times for anyone trying to set aside a little money for the future. If you're investing, you worry that Europe's game of debt-default chicken will wreck your portfolio. Yet you also can't get a decent yield if you try to keep your money completely safe. All of which makes Adam S. Posen a very interesting man to talk to right now. 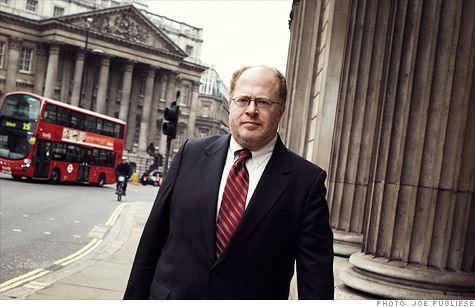 He's an American economist -- his résumé includes a Harvard Ph.D. and a book on Japan's slump -- but since 2009 he has served at the Bank of England, where he is a member of the Monetary Policy Committee, which sets Britain's interest rates and money supply. That committee's next meeting is slated for Thursday. Posen's post at the Bank of England has given him a close-up view of the crisis in Europe (although Britain is outside the euro currency zone). Posen, 45, is also one of the world's most influential monetary policy "doves." Whereas hawks worry that easy money punishes savers and could ignite inflation, he has long argued that central bankers in Europe and their counterparts at the Federal Reserve should stay focused on getting economic growth back on track. He made headlines in April, however, when he pulled back from his dovish stance somewhat, voting against further easing of the pound. His conversation with senior writer Kim Clark -- which took place before Posen's policy change -- has been edited. How bad is the situation in Europe now? At this point there is a human tragedy in Greece, but the worst is probably over for now in the rest of Europe. After years of dilly-dallying, policymakers have successfully contained the Greek problem. And the European Central Bank [the eurozone's version of the Federal Reserve] finally stood up and took some aggressive action. I think they have successfully fended off the worst things from happening. But it is going to be a long, miserable slog for millions of people in Europe. Real wages for workers in Ireland, Italy, Portugal, and Spain are being compressed, while their welfare states are being sharply reduced. Unemployment is high and rising, particularly for young people. What does that mean for the American economy? I think the U.S. is going to grow pretty strongly this coming year, but the fact that Europe will be shrinking is a headwind for us. In the U.K. and Europe, as in the U.S., there are sharp debates over deficits. Should governments spend to create jobs or reduce spending to avoid Greece's fate? There are three categories of countries. You have countries like Spain where, if it had not been for the crisis, they would not have done much deficit spending. Then there are countries that are not able to collect taxes and have been spending too much for a long time: Greece and, to some degree, Italy. There is distrust of government in these societies, and large black markets. And then you have the countries that do collect taxes but went on a spending binge during the mid-2000s bubble, including Ireland, arguably the U.K., and the U.S. In the U.S.'s case, we were spending on wars, among other things. If you're Greece, you need a wholesale change in how you do business right now because no one will give you credit. The U.S. and the U.K. are not Greece. The markets are lending money to us at very, very low interest rates. You don't have to do something this minute. Whether investors will continue to give our governments cheap credit is not about this or next year's deficit, it is about the long-term fiscal trends. In the U.S. the main discussion should be about health care spending, which is going up faster than the government can afford. Central banks around the world have cut interest rates to the bone. Savers complain that they are paying the price for others' fiscal irresponsibility. Of all the complaints I get as a policymaker, this is the one that concerns me most. My own mother is retired, and sensibly kept most of her savings in government bonds. And the interest rates on them are now very low. She calls and complains to you? No, because I think I have convinced her that it's the right policy. As much as you may not like the low rates, the alternative for retired investors like her would have been much, much worse. If central banks had not provided emergency loans to financial institutions, and aggressively cut short-term interest rates, you would have had failed banks, insolvent pension funds, and collapsing investment values. Also, central bankers should make policy for the economy as a whole. There's no question that these policies have led to more stable prices, less rise in unemployment, and, now, a return to growth. What would have to change for rate hikes to make sense? Sustained strong GDP growth, declining unemployment, rising wage growth, and, as a result, forecasts that inflation will rise. You don't have much growth in the U.K., but the U.S. has job and GDP growth. There is still slack in the economy. The U.S. is just now starting to get wage growth. There's certainly room to take unemployment down from the level [8.1% in April] it is now. Leaving aside risks to oil prices, neither U.S. nor U.K. core inflation is that high, so if I were at the Fed, I would not be looking to raise rates right now. What about rising prices for gold and oil. Doesn't that suggest inflation ahead? It is misleading to pretend commodities prices reflect something fundamental, rather than just one part of the economy and some speculation. There is so much else that we spend on that is not correlated with commodities: electronics, education, health care. Commodity prices are not good predictors of general price trends. Look at gold. It's gone up enormously in five years, but that bears no resemblance to what's happened to housing or wages. It's stupid to set policy on the basis of something that doesn't predict what you should care about. These prices fluctuate so much that if we set monetary policy based on them, we'd end up yanking the economy around, causing damage and uncertainty. How does an American like you get a vote on U.K. interest rates? The British government has a principle they call "all the talent," in which they take people from all over the world who can contribute. The British people have been amazingly welcoming. When I was appointed, I was invited to a dinner for the Fed's Open Market Committee, and everyone said, "Congratulations." But several FOMC members said to me, "Can you imagine a foreigner at the Fed? Ha-ha! Congress would burn down the building! Ha-ha!" Do you know a Money Hero? Money magazine is celebrating people, both famous and unsung, who have done extraordinary work to improve others' financial well-being. To nominate your Money Hero.